It has been jokingly dubbed the "iPad uprising," but it is no exaggeration to say the past month's protests have been highly reliant on modern communications. But the phone networks that high-tech activists rely on let them down at recent rallies. All three of Russia's main mobile providers — Beeline, MTS and MegaFon — suffered service failures at the Dec. 10 demonstration on Bolotnaya Ploshchad and last weekend's follow-up rally on Prospekt Akademika Sakharova. Beeline said it saw loads on its base stations jump 22 times higher than the daily average around Bolotnaya Ploshchad. MTS saw usage jump by a factor of 10, and MegaFon by five, RIA-Novosti reported. "The network is not designed to handle tens of thousands of people gathered in one place, so all the operators experienced massive overloads," a Beeline spokeswoman said in response to e-mailed enquires. MTS and MegaFon did not respond to requests to comment by late Wednesday. Beeline said they thought their efforts at Sakharova had been "successful," but the results seem to have been patchy. One Moscow Times reporter with a Beeline phone had no reception at all on Prospekt Akademika Sakharova, but found it working perfectly just a minute's walk away down a sidestreet. 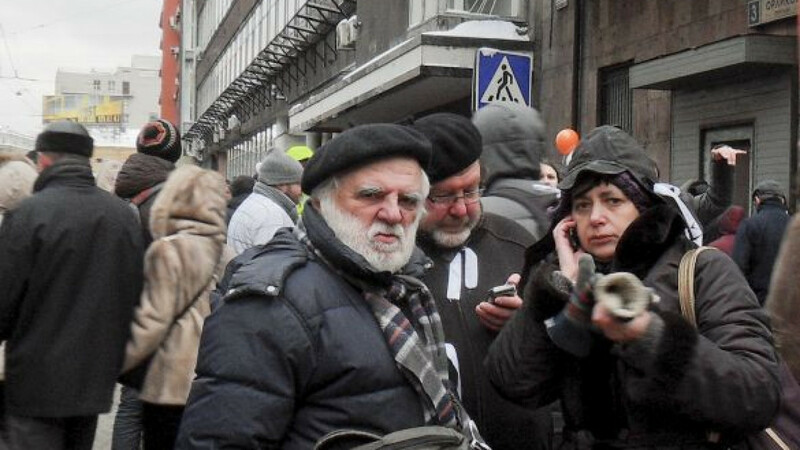 Other demonstrators and reporters using the network told The Moscow Times they had near faultless service. Anastasia, a Beeline user who attended both demonstrations, said the network worked "with varying success." "Internet was very slow and there was a long delay sending MMS messages," she said. "But Bolotnaya was better than on Sakharova." "Beeline was patchy; MTS was completely blocked; I'm not sure about MegaFon," said Olga Romanova, a journalist and member of the committee that organized the demonstrations. Moscow Times reporters had similarly mixed experiences with the other networks. While some were unable to use MTS, others found they could access the network by holding their phones above their heads. Protests were mostly organized on Facebook, Twitter coverage proved key to those wanting to follow events as they happened, and many of the allegations of electoral fraud that sparked the December protest were provided by observers armed with nothing more than a camera phone and a 3G connection. With the protest movement's obvious dependence on mobile telephony and the Internet, some have voiced suspicions about the true cause of the difficulties. But while it's true the security services would have no problem turning off mobile phone coverage in a given area if they wanted to, it is far from clear they had a role, said Andrei Soldatov, an expert on the Russian security services. "The only time I can recall the security services interfering with mobile phone coverage was during the Dubrovka theater siege, and then they didn't turn off coverage — they just opened up encryption so your messages could be read and your calls listened to," Soldatov said. Besides, he added, the key social-networking site was Facebook, which is not as reliant on mobile coverage as Twitter. "I'm not especially suspicious," Romanova concurred. "We spoke to them, but they said they would be unable to install that much capacity at such short notice." Russian law requires mobile operators to provide the security services with access to databases and other information, but it is not clear whether there are any special connections between any of them, Soldatov said. MegaFon became a national mobile operator on the back of North-West GSM, the country's first GSM operator, based in St. Petersburg. Much of the company's senior management hails from St. Petersburg. MTS is part of Moscow-based oligarch Vladimir Yevtushenkov's AFK Sistema. VimpelCom was the first national mobile operator, founded in the early 1990s by Dmitry Zimin. The company was challenged by federal regulators on several occasions over the years, including issues about alleged tax debts, frequency distribution and operating licenses.